Tonight we take a look at the life and the music of Peetie Wheatstraw. Born 1n 1902, his real name was William Bunch. There is some confusion on where he was from, some saying Tennessee, while others, noting his body was returned to Arkansas. In his career, he recorded 161 songs. This was a huge volume of work in an era that saw an almost complete shutdown of blues recordings due to the great depression. His skills with the piano were without peer in his time. He also played guitar, and was a very popular singer. He was based in St Louis and seldom left, other than to record. He had wide influence over others of the time and after. 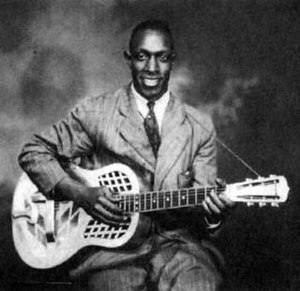 The great Robert Johnson basically reworked many of Peetie’s songs, using the vocal and lyrical styles of his songs. His influence can also be noticed in such piano players as Jerry Lee Lewis. Tragically, Peetie died in a horrific car crash on his birthday in 1941, at the age of 41. The vehicle he was in hit a freight train. The people in the car with him died instantly and he passed away a few hours later of massive head trauma. The music remains, and we will start with his classic “Police Station Blues”. Some say that the song below by Robert Johnson is a reworking of Police Station Blues. Take a listen, the similarities are definitely there. This song was used on the soundtrack of Mafia II. You can hear what influenced Jerry Lee Lewis very clearly in this tune. This entry was posted in Blues, Live Music, Music History and tagged Blues, Music, Peetie Wheatstraw. Bookmark the permalink. Love this, especially the last track. What are you basing your blues artist roll on? An old set of 4 cd’s. History of the blues, conveniently in some sort of date order. I uploaded to my iTunes a few years ago and the songs pop up here and there. 1700 songs on there so not a constant stream. I was listening to one and thought this would be a great template for a series. iPods and YouTube are a deadly combo. I have often fallen into the trap of the dreaded iPod and YouTube — much time was spent watching music videos. Totally feel the influences Peetie had on so many artists. Great add.